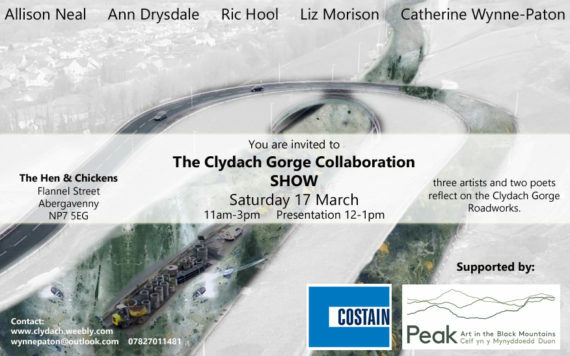 The Clydach Gorge Collaboration brings together local artists and writers who are now beginning sharing ideas about the culture, history, engineering, geology and nature of the site which currently has the extensive A465 roadworks making significant changes to the land. Initiated by artist Dr Allison Neal whose attention had been caught by the huge changes to the land and had begun creating drawings in response, but she also invited other artists and writers to do the same and share the work within a loose collaborative group. Allison Neal: The Clydach Gorge is a quiet and personal landscape but one that is as familiar as an old coat. The landscape itself becomes a closely fitting, comfortable coat. I’ll be exhibiting the paintings that I have been making from this landscape. Ann Drysdale: During the course of the project I found my eyes, ears and understanding opened and my attitude changed to a mixture of admiration and qualified acceptance. I’ll be giving a stand-up performance of the poems I’ve written surrounded by the work of my fellow-contributors. Liz Morison: My response is still developing, ideas being thrown up and then rearranged or discarded, like giant earth moving equipment scoring and reconfiguring. I was very moved by one of the group discussions we had about memory and the Clydach Gorge. The length of time of construction has resulted in a proportion of the community who has never known anything different. I make films and interactive objects. Catherine Wynne-Paton: My approach to the Clydach Gorge has been to spend time there exploring visually and through conversation. In spring 2017 I gave out Little Gem lettuces to gather little gems about the area as remembered by residents as a part of my research. I’ve been painting and etching in response to the area and pursuing surfacing ideas in unexpected and surprising directions. With special thanks to Arts Alive for the Mini Fund awarded to Catherine Wynne-Paton, use of their hall in Crickhowell, Greenfingers in Abergavenny for growing little gem lettuces, to the Costain Group for their support and to The Hen & Chickens for the venue. I am a conceptual artist, living in Abergavenny and working between Wales and London. The source of my work often evolves as a response to conversations, individual word collections and specific sites. I attempt to uncover visions locked away in words and phrases through other media, especially in printmaking, painting, video and performance art. I create exhibitions, in particular a series titled ‘PaperFields’ working towards an artists exchange: showing regional artists work in London and London artists work regionally.